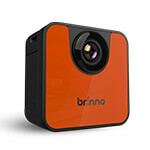 The Brinno TLC200 Pro offers a high dynamic range sensor (HDR) while retaining exceptional battery life (up to 3 months on a set of AA batteries). The HDR sensor improves high contrast scenes and is great for indoor or outdoor work (with the ATH 120 housing). High performane HDR video sensor, capture Time Lapse video in any light! TLC200 Pro captures and converts thousands of photos into a Time Lapse video. Awesome low light recording and sharper images. Don't like the lens included? Fine, choose the lens you want. A wider area can be recorded creating panoramic images! Still images (JPEG, 1280 x 720) Can be extracted with the Brinno Video Player (PC only) available at the bottom of the Brinno Download Page. Site operated by Phase 3 Systems, the Master Distributor of Brinno products in North America. We are dedicated to product sales and support in North America, please visit Brinno Global for additional information.